Dropdown problems allow learners to choose from a collection of answer options that are presented in a dropdown list. Unlike multiple choice problems, which have answers that are always visible directly below the question, dropdown problems do not show answer choices until the learner clicks the dropdown arrow. For the dropdown problems in your course, you can use edX Insights to review aggregated learner performance data and examine submitted answers. For more information, see Using edX Insights. You can create dropdown problems in the simple editor or in the advanced editor. You can set up a problem in the simple editor, and then switch to the advanced editor to add more configuration options in XML. However, you cannot switch back to the simple editor from the advanced editor. Therefore, you might want to format the problem as completely as possible before you begin to use the advanced editor. To use the simple editor to create a dropdown problem, follow these steps. Select one of the two dropdown problem templates. From the list of Common Problem Types, select Dropdown. From the list of Common Problems with Hints and Feedback, select Dropdown with Hints and Feedback. For more information, see Use Feedback in a Dropdown Problem. Studio adds the problem to the unit. Select Edit. The simple editor opens. Replace the sample problem text with your own text. Determine the text that describes the question you want learners to answer, and surround that text with two pairs of angle brackets (>>question<<). This text identifies the question for screen readers, reports, and Insights. Edit your text to place all of the possible answers on the same line, separated by commas. Select all of the answer options, and then select Dropdown from the toolbar. A double set of brackets ([[ ]]) appears to surround the answer options. To identify the problem’s answer, locate that answer inside the brackets and surround the correct answer with parentheses. To provide an explanation, select the explanation text and then select Explanation from the toolbar. [explanation] appears before and after the explanation text. Select Settings and provide an identifying Display Name for the problem. Define additional settings for the problem. For more information, see Problem Settings. For the example problem illustrated above, the following text is displayed in the problem component. To use the advanced editor to edit a dropdown problem, follow these steps. Follow the steps for creating the problem in the simple editor. Select Advanced Editor, and then edit the XML to add the tags and attributes you want. An example follows. You can add feedback in a dropdown problem using the simple editor or the advanced editor. For an overview of feedback in problems, see Adding Feedback and Hints to a Problem. In dropdown problems, you can provide feedback for each option that a learner can select. Use the following guidelines when providing feedback. Use feedback for the incorrect answers to target common misperceptions and mistakes. Use feedback for the correct answer as an opportunity to reinforce why the answer is correct. Because learners are able to guess, ensure that feedback provides a reason why the answer is correct for learners who might have selected that answer by chance. In the simple editor, you configure answer feedback with the following syntax. When you create a new dropdown problem, select the template Dropdown with Hints and Feedback. This template has example feedback syntax that you can replace. For example, the following problem has feedback for each possible answer. Feedback for when learner selects this answer. contains seeds classifying it as a fruit. contains seeds it is classified as a fruit. The default labels Correct and Incorrect are displayed in the learner’s requested language. If you provide custom labels, they are displayed to all users as you configure them and are not translated into different languages. 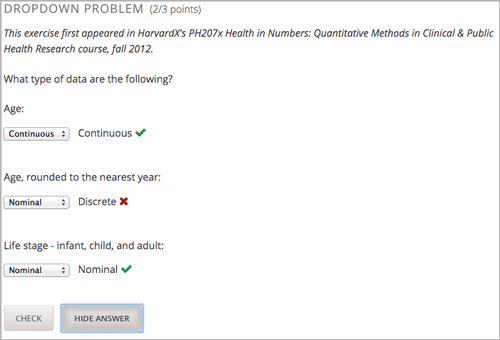 Feedback for learners who select this answer. is classified as a fruit. You can use hints in a dropdown problem, using the simple editor or the advanced editor. For an overview of hints in problems, see Adding Feedback and Hints to a Problem. In the advanced editor, you configure each hint in the <hint> element within the <demandhint> element. For example, the following XML shows two hints. <optionresponse> (required): Indicates that the problem is a dropdown problem. <option> (required): Lists an answer option. <demandhint> (optional): Specifies hints for the learner. Indicates that the problem is a dropdown problem. correct (required) Indicates whether an answer is correct. Possible values are “true” and “false”. Only one correct attribute can be set to “true”. Specifies a hint for the answer. Specifies hints available to the learner. Specifies a hint available to the learner.